Keep in mind that anyone who can read your post will be able to view any and all of your edits. 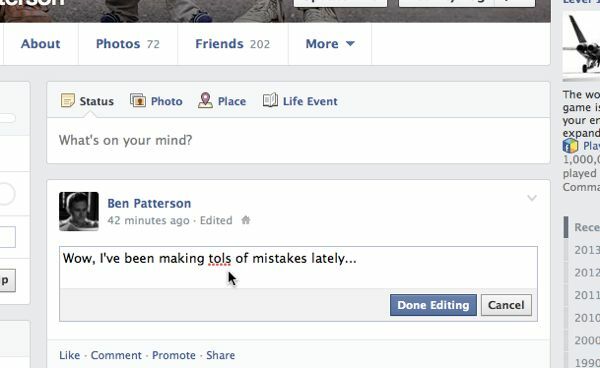 Well, good news: you can now edit any of your previous Facebook updates or comments, perfect for fixing typos, adding new thoughts or clarifying old ones. Find the Facebook update or comment you want to edit, click the faint downward arrow in the top-right corner of the post, then click Edit. Your update or comment should immediately snap into a new dialog box. Go ahead and make your changes, then tap the Done Editing button. 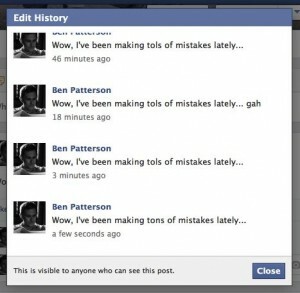 Before you start rewriting history, keep in mind that any Facebook posts you edit will be stamped with an “Edited” link, and anyone who can view the post can review your edits by clicking the link.